Before they went on to distinguish themselves in the Battle of Britain, many a Royal Air Force fighter ace learned the fundamentals of flight at the controls of DeHavilland's venerable Tiger Moth. Its forgiving flight manners and elegant lines endeared many a young English aviator in much the same way as the J-3 Cub enchanted thousands of novice pilots in the U.S.. More than six decades later the Tiger Moth continues to symbolize the elegance and adventure of flight for thousands of aviation enthusiasts. GWS captures the essence of this golden era classic in a delightfully scale-looking slow flyer kit that possesses the same pleasing flight characteristics as its full-scale inspiration- and it's ideal for indoor flight. The Tiger Moth requires at least a 3-channel FM radio system and sub-micro flight pack, which you provide. It features all-foam construction and goes together easily in about four to six hours. No painting is necessary, as all the foam parts are prepainted in authentic Tiger Moth yellow. 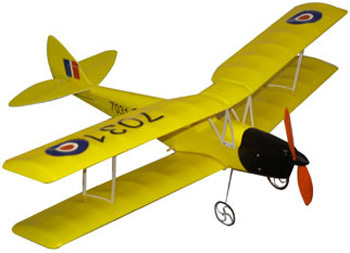 Other scale touches include the Tiger Moth's trademark swept wings and tails surfaces, black molded cowling, and a decal sheet featuring authentic British markings. Completely assembled, the featherweight flyer weighs in at between 7.5 and 9 ounces, depending on the flight pack that is used. Cruising at a stately 7 mph with full control authority, the Tiger Moth can fly figure eights in an area no larger than 20' x 40'. The two wings provide enough drag to prevent excessive speed build up, even in a nose-low attitude. Stalls are nice and predictable, occurring around 5 mph with full up elevator and without any tip stall surprises. The geared motor and high-efficiency prop that GWS provides with the kit gives the Tiger Moth exceptional climb performance. In our tests we could climb from 5' off the floor to the base of a 40' ceiling in just 7 seconds. To get the most out of the Tiger Moth, we strongly suggest you use GWS's Pico Sub-Micro Flight Pack. It includes a 4-channel FM micro-receiver, 2-Pico Sub-Micro Servos, a 7.2V 150mAh 6-cell stick pack (optional 8.4V 7-cell pack available separately), and a micro-electronic speed control. It is available in both JR and Futaba versions. The GWS Tiger Moth is easily one of the finest slow flyers we've come across to date. Not only is it an outstanding reproduction of a British aviation classic, but it features the same charming flight characteristics that made the full-scale Tiger Moth such a classic to begin with. This one is not to be missed.